David Stimpson is an ex soldier who fought for our country in The Falklands war. Whilst in battle he suffered a life long disability after his four man squad were blown up by an explosive booby trap device planted by the enemy. One member of the squad was killed by the explosion and Dave now suffers from daily multiple epileptic fits after suffering brain injury through the blast. 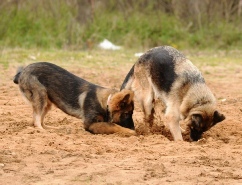 Dave was given a GSD, named Sasha by "The German Disability Association for Epilepsy" as he was living in Germany at the time. 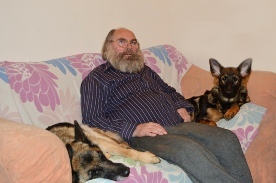 Sasha has lived and assisted Dave on a daily basis for 8.5 years by giving him a 10 minute warning that an epileptic fit is imminent - thus allowing him to find a safe place to be before the attack occurs. 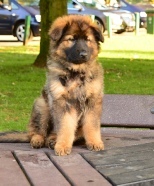 When Sasha was approaching her retirement Dave contacted Rockforce GSD for a puppy replacement. 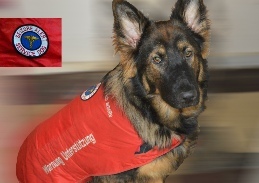 In 2015 Sheba successfully completed her training as a "Seizure Alert Service Dog" and she now wears her official coat whilst on duty caring for Dave. 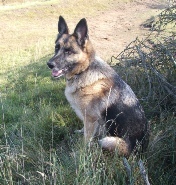 Sasha is now enjoying her retirement and still lives with Dave and her best friend, Sheba.